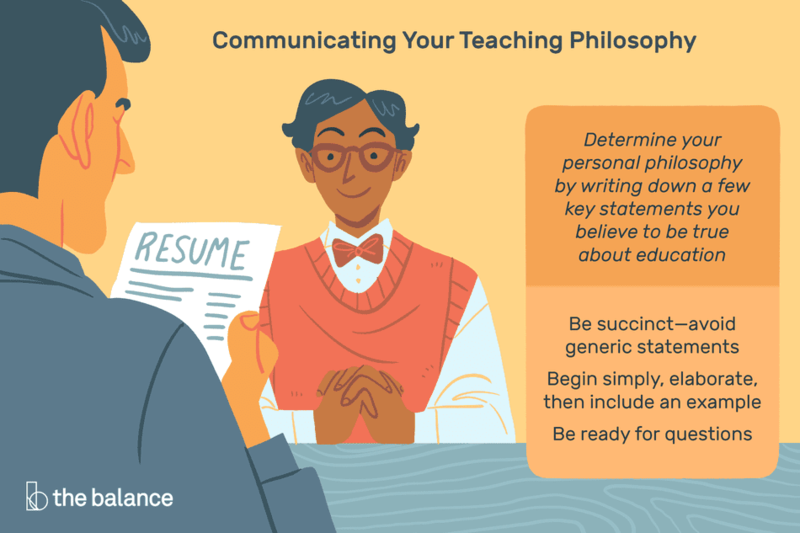 Job Interview Answer: What Is Your Teaching Philosophy? When you apply for a job as a teacher, you may be asked about your teaching philosophy. This is not the sort of question you should fumble – you’ll look unprepared for the job if you don’t have a ready answer. On the other hand, if you have a succinct and clear philosophy, the hiring manager will be impressed by your ability to think about the methods and goals of your teaching practice. Before the job interview, make sure you have a philosophy that you can neatly articulate. A teaching philosophy is an explanation of your values and beliefs as they relate to teaching. Your philosophy is often a combination of methods you studied in college or graduate school and lessons learned during any professional experience since then. It may also draw upon your own experience of childhood education either as a parent or as a child yourself. If you don't know what your teaching philosophy is, try writing down a few key statements you believe to be true about education, and then proceed from there. Think about the methods you apply in the classroom, and your goals for your students. Also consider how you have put your ideas about education into action, and what principles are demonstrated by your work in the classroom. What makes you proud to be a teacher? What lets you know you’ve done a good job? What standards do you set for yourself and why? A personal teaching philosophy is different than a pedagogic theory, although obviously the two are related. Waldorf or Montessori education, for example, involve very different approaches to teaching (pedagogies) than the mainstream American public school system utilizes, and yet teachers from each system might articulate very similar philosophies. Teaching styles and methods often change over a person’s career, so review your philosophy from time to time, update it, and make changes when necessary. Be succinct. A poorly-organized or excessively wordy statement will be hard for other people to understand and could hurt you. Also avoid generic and self-evident statements, like "everybody deserves a chance to learn." Sure, it's broad and applicable to many classroom situations, but that very universality and obviousness makes the phrase a problem. Simply put, if your philosophy is a truism or a cliché, it’s obvious you didn’t put much thought into it. If your educational philosophy actually is that everyone deserves a chance (or something similar), then be sure to make your statement unique by explaining how you see the principle of equality as relevant to education. A provision to keep in mind is that if you can’t imagine anyone disagreeing with your philosophy (that is, disagreeing intelligently, for well-thought-out reasons), then you’ve probably landed on an obvious truism. Begin with one or two sentences that neatly encapsulate your thinking. I believe the classroom is a living community and that everyone, from the principal to the students to the parents, must contribute in order to maintain a positive atmosphere. Everyone in the classroom contributes as a student, teacher, and thinker. I learn from students as much as they learn from me. Notice that all three examples could be part of the same philosophy – while they are different, they nonetheless complement each other. That said, remember that you don’t need to fit everything you believe about teaching into a single sentence. Draft a simple statement that expresses the most central part of your ideas and priorities as a teacher. Let the rest be implied. After giving your initial statement, you can elaborate on what your philosophy means in practical terms. All students are individual and everyone learns in their own unique way. I use multiple methods of teaching (linguistic, visual, auditory, kinesthetic) to reach students, so that no one is left behind. Notice that the elaboration makes the opening statement, as a whole, more specific. In the example above, the idea that everyone learns in their own way could be taken to mean that everyone learns at their own pace. There are indeed educational systems that are not organized into grade levels and that allow students to move at different paces. But here the elaboration makes clear that this teacher believes that effective teaching brings everybody along together. You can also make brief mention of educational theories or scientific studies that support your philosophy, or you can refer to other educators who exemplify your philosophy. You are trying to make it clear to your interviewers that you think carefully about how you teach and are well-educated on educational practices. You can also provide an example of how you apply your teaching philosophy in the classroom. This will help make your philosophy even more concrete. However, only do this if you have enough time. If you have already been speaking for a couple of minutes, or if you feel that the interviewer wants to move on, you can skip this part. Everyone in the classroom contributes as a student, teacher, and thinker. I learn from students as much as they learn from me. One way I emphasize this philosophy in my classes is to incorporate regular feedback from students. For example, I ask students to fill out a mid-course evaluation of the class, in which they reflect on the course goals and provide feedback on whether or not the course is helping them meet these goals thus far. Students have been so insightful, providing useful information for me on what is working in class, and what I can improve upon. I believe we never stop learning, and I want my students to know we can learn from each other. Be ready to respond to related questions, including questions about your classroom management style, and other interview questions commonly asked during a job interview for a teaching position. What Classroom Management Structure Would You Use?